A powerful financier fakes his own death, has plastic surgery and changes his identity to avenge himself on his wife who, repulsed by his unattractiveness, abandoned him on their wedding day. The production was marred by tragedy when eight members of the crew, including director Kenneth Hawks, and two pilots were killed in a mid-air collision during the filming of an aerial scene. 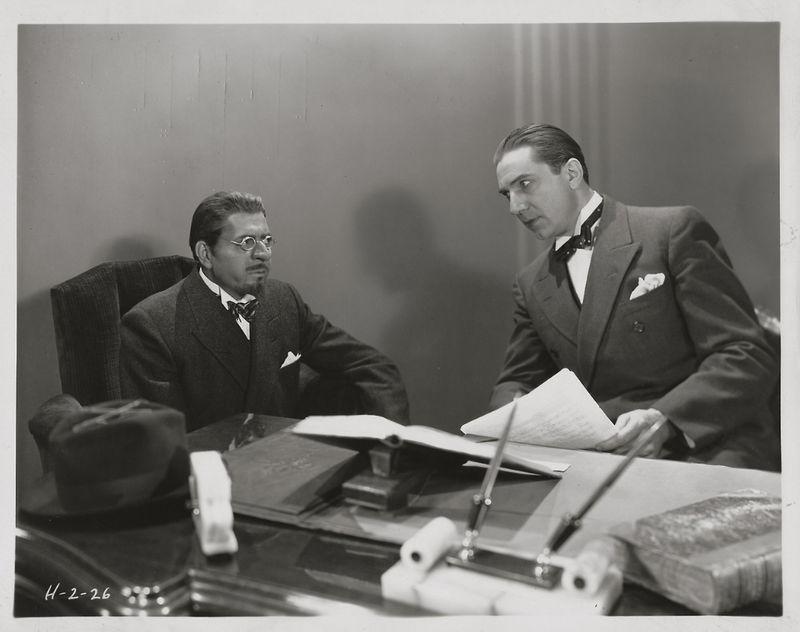 Warner Baxter and Bela Lugosi appeared together in Renegades, released in the same year. 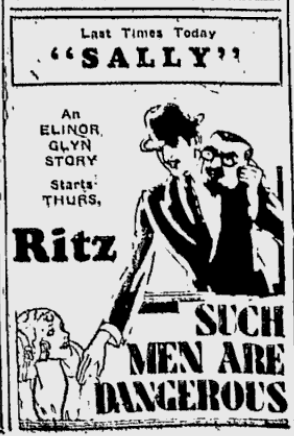 To celebrate the third anniversary of the opening of the Roxy there are at that theatre this week a most interesting talking film and a series of brilliant stage contributions in which the fine hand of S. L. Rothafel is conspicuous. 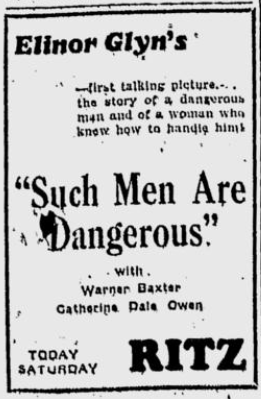 The picture is called “Such Men Are Dangerous.” In the making of some of the air scenes for this production on Jan. 2 last, ten persons including the director, Kenneth Hawks, met death in a collision of flying machines over the Pacific. 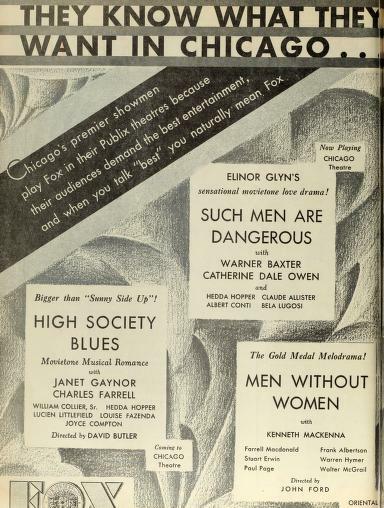 Warner Baxter, the featured player, and a man who doubled for him in a parachute leap were in a third machine far enough away from the accident not to be damaged. The pilot raced this machine back to the shore to summon rescuers. 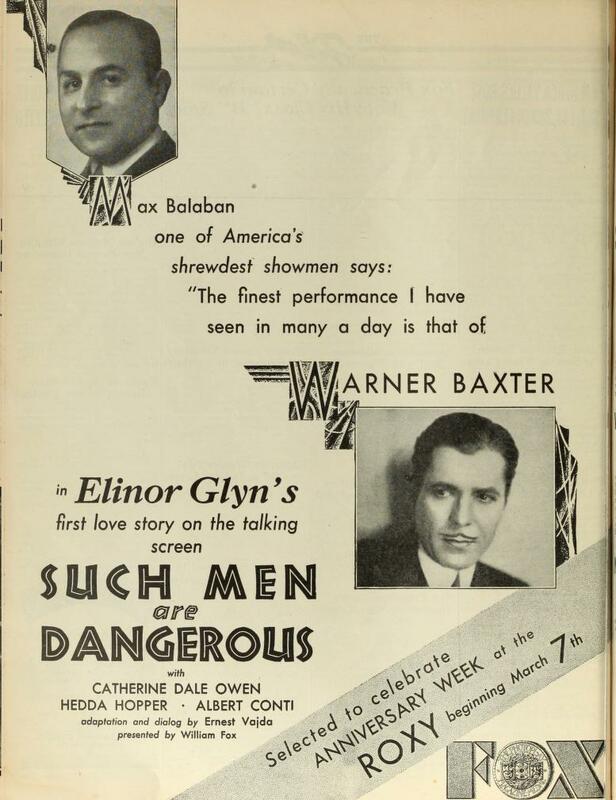 There is in this film an exciting flash of Mr. Baxter’s double making a parachute jump from an airplane. It is an episode that not only recalls the tragedy of the film workers but also the mysterious death of the Belgian financier, Captain Alfred Loewenstein. Mr. Baxter is first seen in a marvelous make-up, with a prominent aquiline nose and a heavy, pointed beard. He impersonates Ludwig Kranz, a man of immense wealth and great power. 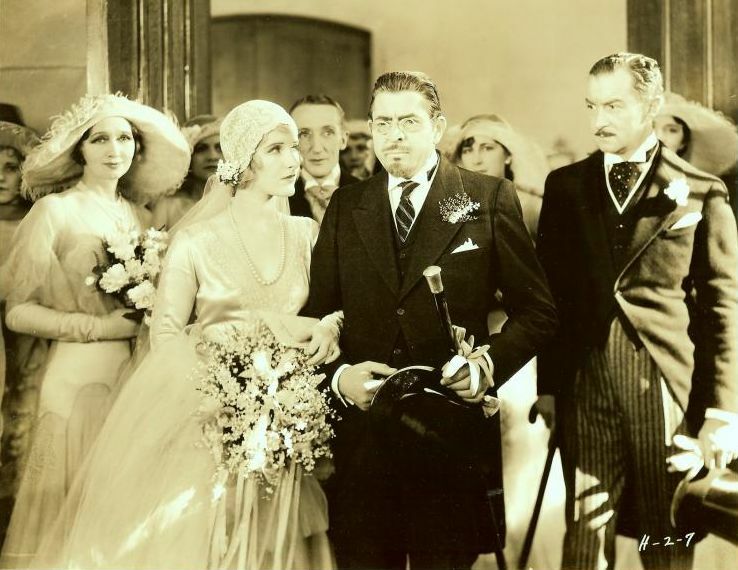 The opening scene is devoted to the pretentious marriage of Kranz and Elinor (Catherine Dale Owen). As the married couple are coming out of the church, a girl happens to remark on Kranz’s forbidding appearance. It is overheard by the bridegroom, who realizes that the girl was probably correct. That night Elinor runs away, leaving no reason for her disappearance. This causes Kranz to reflect further on his ugliness. Kranz is an individual who makes up his mind quickly. He decides to seek revenge on his wife for humiliating him. He tells his secretary to have a drawing account of $100,000 in three banks in Europe in the name of Pierre Veillard. He then orders his airplane and goes forth on a journey alone. While flying the Channel, he, unseen by the pilot, fastens on a parachute and then leaps from the machine to the sea. His disappearance is told with big headlines in the newspapers and the next thing the spectator knows is of his visit to Dr. Goodman, a famous plastic surgeon. Kranz, posing as Veillard, says that he wants his back straightened and his face improved. Can it be done? Dr. Goodman is reluctant to take the case. He is a humanitarian and believes first in attending to war cases. Kranz, however, offers him a check for £20,000 and Goodman decides that as this money can go toward helping many worthy people, he will undertake the case. The next seen of Kranz is when his head is covered with bandages and, eventually, when he is thoroughly healed, he is the handsome Mr. Baxter. Dr. Goodman then returns to Kranz the £20,000 check, as he realizes that this patient is the man who had contributed most generously to his war work. 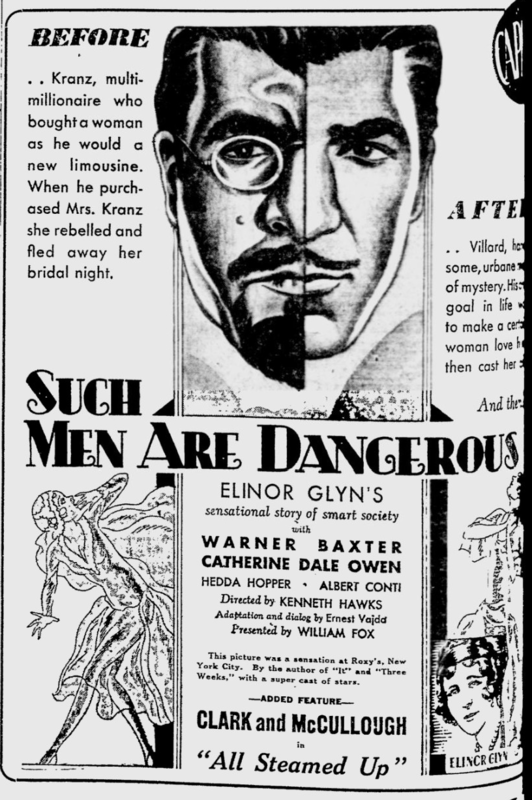 From then on until Kranz decides to uncover his identity to his wife, he is Pierre Veillard, a popular man with the women, and one who attracts even his own wife. Everything seems to have been given attention in this story except Kranz’s voice, which one might presume would be recognized. 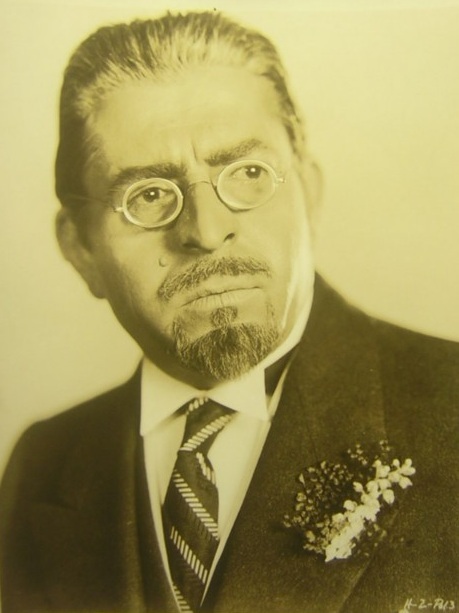 His eyes have been covered with double-lens spectacles, his chin with a beard and his upper lip with a heavy mustache, but the voice is the same, except that after posing as the fascinating Veillard his tones are cheery. It is natural that Kranz’s nature should change with his improved appearance. He has a taste for everything in a lighter vein, including clothes. People no longer look in awe at him, but smile. In the old days the financier never experienced a wholesome smile in his direction. 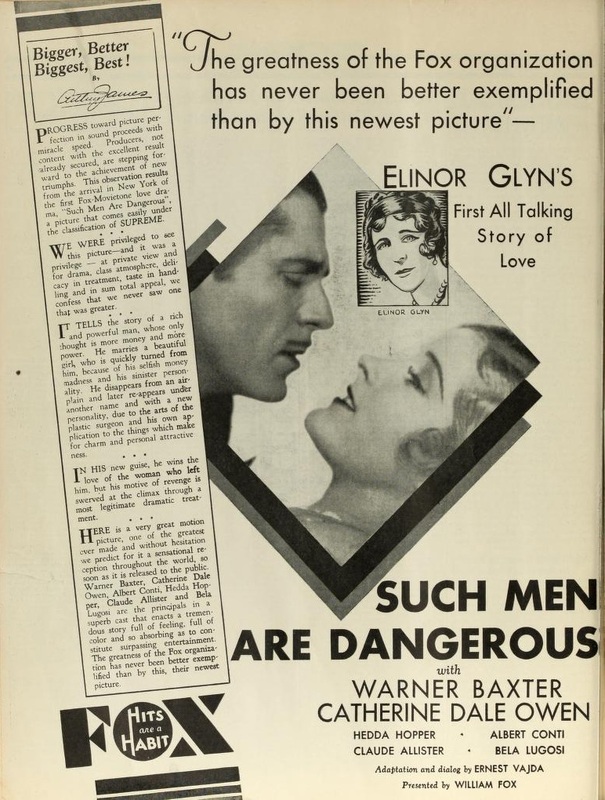 This story was written by Elinor Glyn, and Ernest Vajda undertook to write the dialogue. Mr. Vajda has done exceedingly well with a minimum number of words. 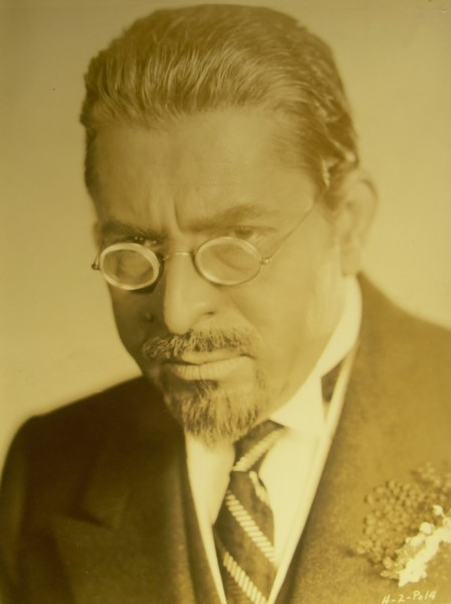 Mr. Baxter gives a serious and highly effective portrayal of Kranz, who in the end is told by Elinor that his soul was uglier than his physiognomy. Catherine Dale Owen is lovely as Elinor. Albert Conti does capital work as Kranz’s secretary and Hedda Hopper makes the most of the part of Elinor’s grasping sister. 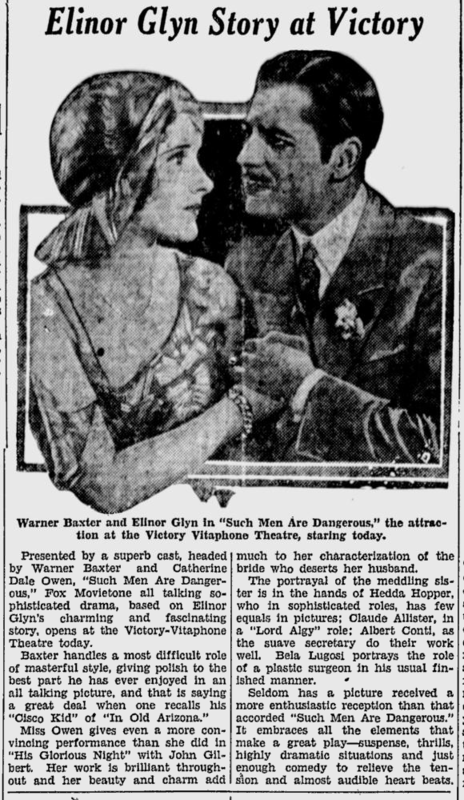 Claude Allister is amusing as a hen-pecked husband, an extravagant type, but nevertheless a merry specimen. Bela Lugosi gives a sincere performance as Dr. Goodman. Skin Deep. 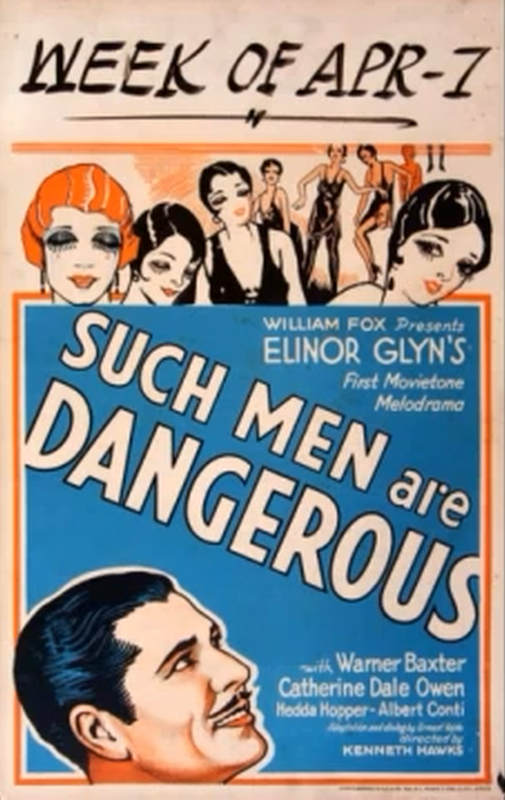 SUCH MEN ARE DANGEROUS, with Warner Baxter, Catherine Dale Owen, Albert Conti, Hedda Hopper, Claude Allister and Bela Lugosi, based on a story by Elinor Glyn, directed by the late Kenneth Hawks; “Laugh, Clown, Laugh,” with Harold Van Duzee; “Processional Religioso”; “In a Jasmine Garden,” with Beatrice Belkin and others; “An Anniversary Party,” with Patricia Bowman, the Roxyettes and others. At the Roxy Theatre.